Crochet a soft, warm, winter slouch hat that’s rustic, but still feminine with this easy pattern! Frost and snow are in the air, and this slouch hat would make a great Christmas gift because of how simple it is to crochet! 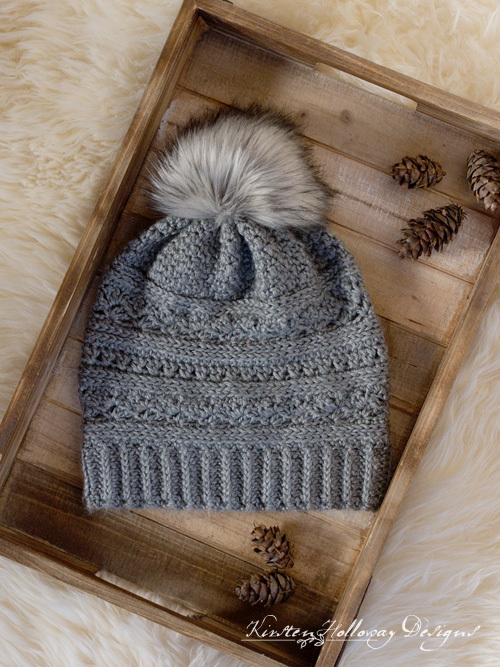 Textured stitches create interest–silvery shadows of trees and mountains–and keep the project fun, while a fur pom-pom adds that extra special touch (instructions for making your own faux fur pom-pom are linked at the bottom of the pattern so you can make one just like it)! I also have a pattern for my Cranberry Twist crochet slouch hat. This pattern started out as a joint design project with my 12 year old son for a long-requested winter hat (he’s the one who asked if I could alternate single crochet and double crochet stitches which you’ll see on the crown of the hat). But since he had to be gone for a couple hours part way through the design process it accidentally morphed into a ladies slouch hat instead. Oops. Old habits die hard. He states emphatically if he had been here [for the whole process] “it would have been a guy hat”. Needless to say I still owe him one. But since this post is about a beautiful crochet slouch hat pattern and not mom guilt, let’s get back on subject, shall we? Hats have been one of my go-to designs for the last couple of years. 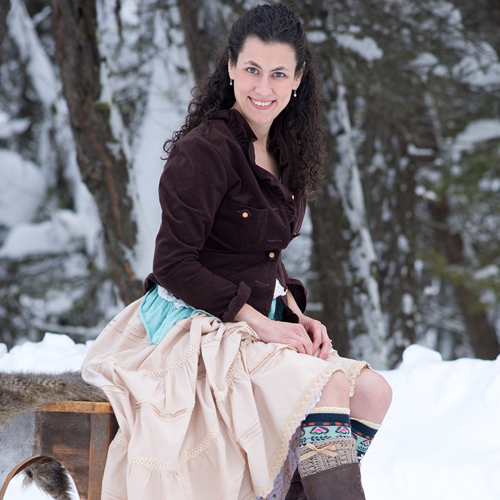 Over that time I’ve used a lot of different yarns, but Caron Simply Soft remains one of my favorites for soft, snuggly crochet pieces that are warm, as well as incredibly comfortable to wear. 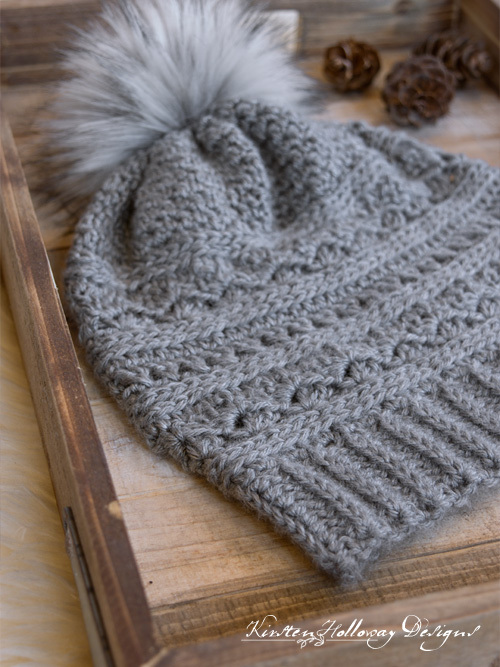 I chose a neutral grey for making this pattern, but the hat would look good in a wide variety of colors, so don’t feel held back by my color choices. An extra special feature of this hat is its faux fur pom-pom. In my humble opinion, faux fur pom-poms give a touch of elegance and class to any crochet hat that a basic yarn pom-pom cannot. Buying faux fur pom-poms from other stores can be expensive, but if you can learn to make your own with a piece of faux fur fabric, stuffing, and a needle and thread, then you don’t have to spend a fortune to create a high-end look! I’ve included a link to instructions on how to make a pom-pom at the bottom of this pattern. It takes 10 minutes–tops. Since I can’t stand anything tight around my head the band is very loose and stretchy. If you have a smaller head, or prefer a tighter fit for your hat, then you will want to omit a few rows from the band. This is very easy to do just as long as you maintain the same stitch count number the pattern calls for in the first round, worked along the edge of the band rows. Cross Stitch: sk st, dc in next st, cross back in front and dc in skipped stitch. To work this pattern you will need to be comfortable Stitching in the “3rd loop” of a hdc. Directions: After turning, work all stitches for that row in the 3rd loop of the hdc from previous row (it will be in the front). Instructions: Look at the top of the stitch, and locate the sideways “V”, bend the stitch to look at the back*, and you should see another “V”. You’ll be working into the back loop of that “V”, this is called the 3rd loop. *When working in rows, this loop will be facing you! 16 hdc in 4″ using 5mm hook. -ch 1 does not count as stitch. -The hat body of this pattern is worked in multiples of 4. The size can be increased or decreased based on that number. Be sure to adjust your band longer or shorter to match. The band should wrap comfortably around your head at this point. If it seems too big you are welcome to leave off some of the final rows, but be sure to adjust your stitches in round 1 below to maintain the same stitch count as the pattern calls for. Drop working yarn, but do not fasten off. Sew ends of band together with 10” tail left over from row 1. Round 19: ch 1, sc in dc, dc in sc; repeat from * around, join with sl st to first sc. Repeat rounds 18-19 5 more times. Fasten off. You should have a large, round tube at this point. Turn it inside out to complete the next part. Cut 18” length of yarn and string half-way through large-eyed yarn needle. Go through every other stitch all the way around the top of the hat, and then cinch it closed. Knot the ends together securely with a square knot. Weave in ends. Turn hat right-side out again. Click here and scroll down the page to view a short picture tutorial on making a faux fur pom-pom. I used a 5″ circle for the hat’s pom-pom. Sew pom-pom securely to hat. If your local Joann’s craft store does not carry faux fur fabric, or if you don’t want to make your own pom-pom as described above, then you can use a large pom-pom maker to create a yarn pom-pom instead. Friends, if you enjoyed this crochet slouch hat pattern, then don’t forget to sign up for my newsletter! That way you’ll never miss out on special events, or freebies I’m offering. Sharing a link to this post with your friends is also always appreciated! You are welcome to share the link to this pattern, using one image of your choice, on your site, but please do not share the written patterns themselves, or use additional images. I do not grant permission to use my images by themselves on Pinterest, however they may be included in a roundup pin if there are 4 or more other patterns. If you sell finished items online, then please do not use my pictures for your listings. I’m positive that your work is of high enough quality for you to sell the finished piece, so have confidence in your abilities! <3 Thank you! This crochet slouch hat pattern was made to be used by individuals, and small business crocheters alike. Selling your finished pieces in boutiques, at farmer’s markets, craft shows and other events is encouraged! However, the only thing I require is that it not be used commercially to produce millions of copies. If I chain 11. HDC in 3rd chain from hook, how can I end up with 10 stiches. I get 9. The sell them on Amazon, pre-made, but making them yourself is fun too. I am confused about the brim. I don’t understand what you mean by”working in 3rd loop of hdc from previous row.” What is the “3rd loop”? I was expecting to be doing front/back loop only from the pictures. Is this what you mean by 3rd loop? Or is this a reference to wher eyou say to skip the first stitch of each row? Oh I’m sorry, I guess I scrolled right past those notes! Thanks for pointing them out and directing me to a video! I feel silly haha. No worries! It’s easy to do. I’m glad they helped! This has me so confused. I’m on row 15, but I’m supposed to go all the way down to row 5? Please help! I’m anxious to finish this beautiful pattern!!! On the brim, I know it says 60 rows but I am at 39 at it will already go around my head. I do not have a small head lol Am I stitching way to loose? You might be, but I did design this to have a somewhat loose band. If it’s fitting around your head in the same way you like your hats to fit, then feel free to start working on the next part of the hat. You will need to keep the stitch counts the same as what the pattern calls for. For round 6 do you turn again and start doing it in the round? The stitches aren’t lining up with round 5, skipping a lot of stitches if that makes sense? Or do I keep doing it from the back until it says turn again? I love this new pattern,I want to try it,but I have avoided using caron simply soft. I made my cousin fingerless gloves,they came out beautiful,but when I saw her a month later,they were a mass of fuzz. Do you hand wash your items made with this yarn. My uncle just gave me twenty dollars for this hat 😂 I loved making this though and plan on checking out your other patterns! Hi. Haven’t crocheted in a long while and have always been terrible at modifying patterns myself. If I do 56 rows for the band, I’m assuming I don’t do 80 hdc, correct? Help! Yes, you will still need to do 80 hdc. 😉 You will need to space them along the edge a bit differently than I have mine written out, and that will be the part you’ll have to play with. I’m sure you’ll get it though! This my second hat pattern that I have done from you. You have such great patterns and I like how you give your instruction. I am not finished with my hat yet, but so far it looks beautiful. For those people who are NOT against using REAL fur, may I suggest using rabbit fur? Rabbits molt, or “shed” their fur 4 times a year. If you have one, or know someone who does, you can collect the molted fur, hand wash it and comb it out when dry. I have a pet rabbit, a Lion Head for those who know rabbits, and he’s a “house bunny”, which means he is free to roam the house when we are home. I typically use his fur when a fur pom is called for. If I have a need for a larger amount, I have a friend who breeds pet rabbits and she will collect some for me. Just an option for those who are interested. That’s a neat idea! Thank you for sharing the information! Can you elaborate more on how you make the pom pom or provide a website or video on how to make the fur poms from rabbit fur? I live in a farming community and I bet I could get some rabbit fur! I am impossible. I cannot follow written instructions. Can you do this hat in a video form for those like me? I can follow video usually… See it on FB? I shared this on Pinterest and it was removed for copyright violation.. It probably was shared from a source that did not lead directly to my page. There are quite a few scraper sites out there that steal my images in order to get traffic to their site first. I report them as copyright violations as often as I see them. My site is the original site for this hat pattern. If the pin says it’s from Kirsten Holloway Designs but does not send you directly here to this site it is one of those scraper sites. I see. Ok. I will share from here. Your patterns are wonderful, btw! Unfortunately, because of the way it is designed omitting rows won’t really help. It will make the hat lumpy and not lay right. I think this pattern looks beautiful but I started doing the ribbing and ive never worked in the 3rd loop in rows, im finding that my ribbing lays more flat than it appears in your pictures. Are you supposed to approach the loop from the top or go underneath? I tried putting a yarn pom pom on my finished hat, not the same! So i took it off and put the faux fur one on it. MUCH BETTER! love it! Yes, the fur pom-pom is really what makes it! 😀 So glad you like your new hat! I made this as a gift for my adult niece. I enjoyed following the pattern and love the end result! Here’s a tip for those people having a hard time finding faux fur fabric: I couldn’t find faux fur, and didn’t want to wait for an online order to arrive , so I visited my local thrift shop and found a coat with a hood that was lined with a beautiful faux fur! The purchase only cost me $7! I ended up with enough fur for about 12 pom poms! Thank you for sharing your idea, Mara! I’m glad you enjoyed making the hat! I’m having a hard time figure out where to put my stitches in Row 1. I understand that I’m doing increases but crocheting into the side of the band doesn’t give me obvious places to do the “2 hdc in first hdc, hdc in each of the next 2 hdc sts”. The photos I’ve seen here and on ravelry are pretty far from the work, so it’s hard to use them as a guide. Thanks for the help! The band is also made of hdc stitches. Look at the band and work the designated number of stitches the side of each hdc stitch. 🙂 If you have never worked a hat from the bottom up with a band like this it may take a time or two to really feel comfortable making it, but hopefully this info helps! This is a beautiful pattern. Thank you so much for sharing it. I’m making one for a friend, but I do have a couple of questions, all having to do with transitioning between certain rows. Do you chain between rows 6, 7 & 8, and between rows 15, 16 & 17? I’m working on the body of the hat and have just finished rounds 2 and 3. I’m new to working in the 3rd loop of an hdc. The video you linked to earlier in the comments was really helpful and I feel like my band came out right. On these rounds though, since there’s not an instruction to turn, but just to keep working on the round, it seems like the cute ribbed effect is happening on the inside of the hat. Am I missing something ….? When you switch to working in the round your ribs should be facing outward, so work in the 3rd loop at the back of the stitch. It won’t be facing you like it did in the band since you are not working in rows anymore. I hope that helps! Thanks for your response! It was awkward to stitch that way, but totally works to make the cute ribbed effect. Thanks! You’re welcome! I’m glad you are happy with how it turned out!